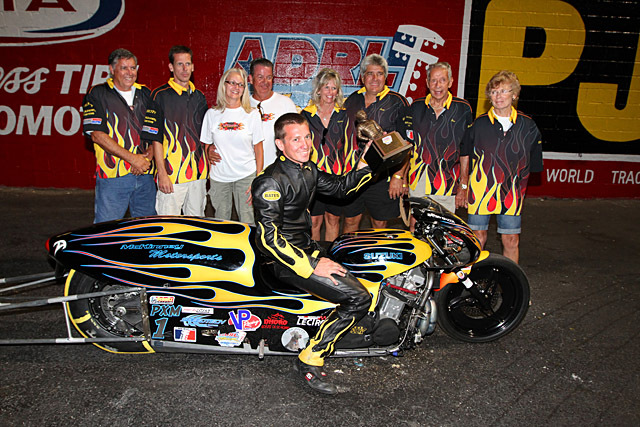 Pro Extreme Motorcycle racer Eric McKinney and his dominant McKinney Motorsports team went to the American Drag Racing League’s marquee Dragstock X event at Rockingham Dragway with three goals in mind. Well, two out of three ain’t bad, as McKinney won the race and swept to his second straight season championship, but gave up the ADRL’s coveted Battle for the Belt in the process. 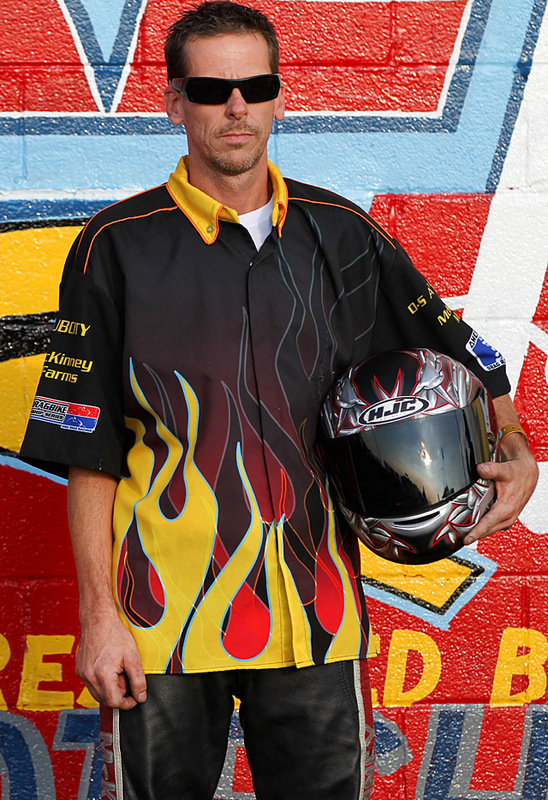 The Belt run started poorly for the team right off the bat when teammate and tuner Ashley Owens’ bike blew up in top gear and he lost to Ronnie Procopio in round 1. “I think the motor was hurt the pass before and we were going to just try to get through the first round and change it,” said Owens. McKinney fared better, running a strong 4.04 at 176 to boot Charlie Prophit. When McKinney faced Travis Davis in round 2, Eric’s dad Scott knew that Davis’ bike was hurt and made an audible to turn Eric’s bike down a notch, slowing him to a 4.10 and giving up lane choice for the final to Dave Norris, who ran 4.09 to win the other semi over Procopio. And then when the team needed all the steam the bike could muster for the final, it wasn’t there. With both lights about the same, Eric’s 4.13 fell short against Norris’ 4.12. 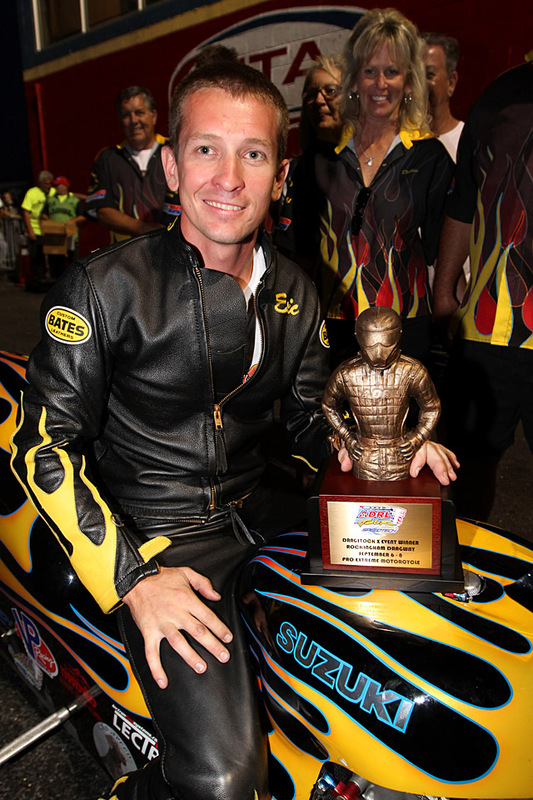 The $20,000 purse, the flashy trophy that is the ADRL’s Belt—all gone. It was a cruel case of déjà vu for Owens, who won every race in 2010 on Paul Gast’s bike, only to lose the Belt in the final to Kim Morrell. Back then the Belt was everything—the whole championship, win or lose right there and then. It was because of Owens’ bitter twist of fate that the Belt and the championship were separated, and now he’d seen his team loose their grasp on another Belt—that cruel mistress and her vengeful curse. Maybe it’s called a Belt because it’s like a sock in the jaw. “It is, and it’s killed that kid,” Scott said, pointing to son Eric. That would be the 6-race Arabian Drag Racing League season at the Qatar Racing Club this winter in Doha. A quarter million dollar bonus awaits the McKinney team if they lock down both ADRL championships. “I feel bad because, you know, probably if I hadn’t have said, ‘Turn it down,’ the round against Travis, we might have caught the problem earlier. I was afraid it was going to blow up, so we didn’t run it full blast, and we had a problem that didn’t show itself until the final. “A couple of weeks ago, I said, ‘You know, this bike is done. It’s got 150 runs. All these parts are getting worn out, and I didn’t know when it was going to happen, but I knew it would and I wanted to change some things. But we tore the motor down and it’s like a brand new one, so it’s not the engine. It’s electrical, or battery. “And that’s another thing. I bought a new battery and put it in the trailer. I bought some new solenoids and things to stock up on, and wiring, and I’ve been saying ‘Before we go over to Qatar, I’d like to strip this bike down. It’s just got so many runs, something’s going to go bad.’ And it did. “But where I feel bad, is where I turned it down against Travis. That was my fault. I knew that Travis was hurt and wasn’t going to make it. And then Travis tells us they were in such a hurry, somebody forgot to plug his solenoid in.” Perhaps it t’was the Curse of the Belt that did Davis in also. Before the final, Scott said “If Dave Norris wins this, you know, I won’t be unhappy.” But now he was really unhappy. “I feel bad for that kid,” Scott said about Eric. “And Ashley. These guys worked so hard. It’s a lot of money, but I look at that different. And that might sound silly. Eric wanted that Belt, and I knew that someday we were going to get beat. I didn’t want it to be today. We didn’t want it to be tomorrow, either. Or this year, actually. “But it was going to happen. And I’ve been telling my wife, I’ve just been so worried about this motorcycle having so many runs. I’ve never owned a Pro Mod that had 150 passes, but because Eric’s won so much these last two years, it’s gone a lot of rounds. But when qualifying started in the morning, the McKinney Motorsport bikes were still lagging, with Eric fourth with a 4.15 and Owens eighth with a 4.18. Eric improved slightly to a 4.13 in round 2 but stayed fourth, while Owens dropped to eleventh. Eric improved further to 4.11 in Q3 but again stayed fourth. Owens improved to a 4.13 and eighth place. Raceday didn’t get any better for Owens, who lost to Terry Schweigert in round 1. 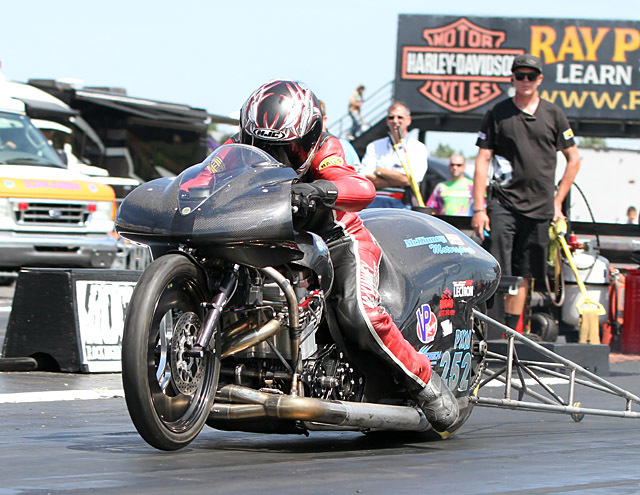 Eric’s fortunes were starting to turn, though, and he broke back into the 4.0s in his win over Casey Stemper. Eric lowered his ET again in round 2 with a win over Kuwaiti star Meshal Al-saber. By now, the points added up and the ADRL PXM season championship was firmly in Eric’s hands. His first big test of the day came in the semis against #1 qualifier David Vantine, whose 4.07 on Saturday was still the high water mark for the weekend. But these two racer’s fortunes were moving in opposite directions, and as Eric improved yet again, Vantine couldn’t find the mustard to compete. 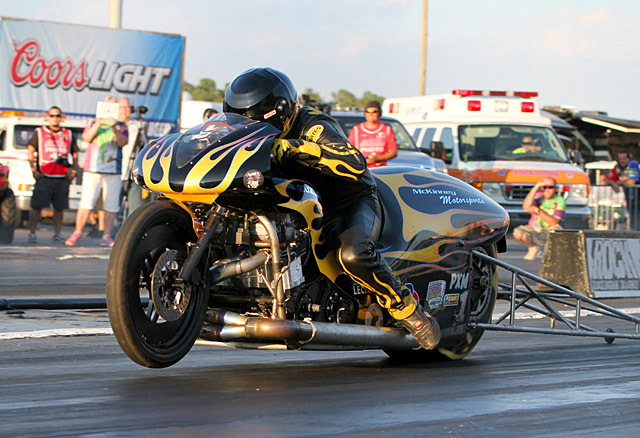 Eric then faced veteran racer and performance vendor Paul Gast in the final. Eric took a hundredth at the tree but Gast had the better 60 foot and ran his best ET of the weekend. That wasn’t enough for Gast, and the winlight came on in McKinney’s lane. “We had a little bit of a tough time this weekend,” continued Owens. “We didn’t have our favorite motor in, and just made the best of it. But it really wasn’t really a motor issue, it was a tuning problem, you know. So by the time we figured out the problem with the bike, you know, electrical problems—this and that—by the time we figured out what was going on with it then we were a couple rounds behind and so didn’t want to put the other motor in. They’re all good motors, and I thought this one would be enough to do it. It’s fresher, with newer stuff in it. I just thought it’d be good to start out with, and we had the other one if we had to have it. “And the problem we had on Friday was a small two-dollar part, if that tells you anything. I’ve said it a million times—that’s what gets you. I mean, you’ve got to constantly go over everything and check, check, check. We’ve got a lot of good help, and Scott’s brother Steve helps us and does the clutch, and is always looking over stuff. So you know, that’s what this racing deal is, just the details. You know what I mean, just catching the little stuff. So we didn’t catch it and it cost—you know, it probably cost us, or may have cost us—the Belt. It definitely didn’t help. “When my son’s at the tree, he doesn’t get rattled,” agreed Scott, who also profusely thanked Owens. “Ashley beat everybody for two years with Paul, and then he came over and started helping us. That kid’s sharp, he’s amazing. He’s got a knack, and he’s disciplined. Ashley is the guy that’s the backbone of the situation. He’ll think up things and just pull it out and make things fast. “And I have to thank Paul Gast. He’s really meticulous with the engines and he’s given me some killer cylinder heads. I told him he’s made a mistake giving us so much horsepower, and I hope he doesn’t stop. If we didn’t have that horsepower, we couldn’t have passed him. And he’s still out here racing, which is great. “And, of course, Dave Schnitz, who really helps Ashley. Ashley talks to him, and he really puts whatever he can into the program. And ProFab has given us a good pipe. “I’d also like to thank McKinney Mart and DNS Auto Parts, and our employees for letting us do this. And my brother Steve has been huge. He has come on and helped do that clutch, and he makes sure everything’s tight, and we don’t have to worry about him telling our secrets and things! “And John Trutnau at PMFR. He’s got this new Viper deal going, but I can call him and talk to him. And I called him a week ago and I said, ‘Man, I need some wheelie bars.’ And four days later, new wheelie bars show up. He’s also been a great help with motor plates, and shifter—little pieces so that we could have extra motors and stuff. And that’s been a big help. 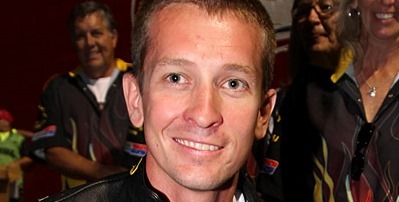 “I want to thank everybody in the ADRL, and my mom and dad,” added Eric. “I’ve got the best crew by far of anybody here, you know. I’ll put them up against anybody. With Ashley tuning this thing, and Dad overseeing, and my Uncle Steve on the clutch. My grandpa’s coming with Jenny to every race. And I had a buddy that passed away five or six years ago, and his parents are with us this weekend. He and I grew up together and now his dad’s been to all of our races. “We lost the battle, but we won the war,” finished Scott. we are getting alot of press wave. To the inline four , power adder and no wheelie bar crowd . We are proud to see you the racing sanctions and race tracks proclaim your use of todays advantage. Use it well.